The redesigned space will feature a two-story sky lobby, outdoor terraces, state-of-art technology and a central, internal staircase connecting each of its five floors. 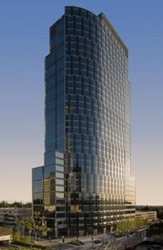 ICM Partners is expanding its Los Angeles corporate headquarters in Century City. The talent and literary agency will remain at the same address, 10250 Constellation Boulevard, also known as Constellation Place, but will relocate from its current three-story space on floors 7, 8 and 9 to the top five floors of the 35-story high rise. ICM Partners, which signed a long-term lease, will occupy a total of 112,000 square feet. Additionally, the agency will receive exclusive building-top signage, the first tenant to have its identity on the tower since MGM. The new headquarters, which has expansive views of the city from the Hollywood sign to downtown and the Pacific Ocean, will undergo extensive renovations prior to move-in, which is scheduled for this summer. The redesigned space will feature a two-story sky lobby, outdoor terraces, state-of-art technology and a central, internal staircase connecting each of its five floors. Mark Sullivan, executive vice president, regional manager and director with global tenant advisory firm Savills Studley, represented ICM Partners in the transaction. “Our client was focused on creating a collaborative and stimulating work environment for its employees and one that represents the future,” said Sullivan. ICM Partners moved from its former Wilshire Boulevard address in Beverly Hills to its current building in Century City in 2007, where it initially occupied 93,000 square feet of office space. Located in the heart of Century City at the corner of Constellation Boulevard and Century Park West, Constellation Place was built in 2003 by an affiliate of Chicago-based developer, JMB Realty Corp. A highly visible Los Angeles architectural landmark, the approximately 795,000-square-foot building was designed by Johnson Fain Partners. Gary Weiss of L.A. Realty Partners represented the landlord in the transaction. ICM Partners also has offices in New York and London.